Corpse Flower watch is in effect! After blooming in the summers of 2008, 2010, 2012, 2014 and 2016, our Titan Arum is blooming again! My best guess as to when the inflorescense will open is July 3 June 30 July 2 (give or take a week four two one day). The Titan Arum can be viewed at any time through the windows on the south side of the greenhouse. As we get closer to the titan arum blooming, the greenhouse will be open from 4PM to 7PM beginning June 18 for the duration of the event. The greenhouse will be open until midnight on the day the inflorescens blooms and will be open from 9AM until 6PM on the day following the bloom. Visitors can enter the greenhouse through the east or west door. Handicap parking will be available on Seventh Street in front of the greenhouse. Wheelchair access into the greenhouse is through the west greenhouse door via the south courtyard gate. 2018 Blog and pictures for your reading and viewing pleasure. Thut Greenhouse location on campus and Titan Arum Event Parking Information (PDF). Greenhouse Twitter Account for up-to-the-minute information. The Titan Arum or Amorphophallus titanum is a flowering plant with the largest unbranched inflorescence in the world. The plant is also known as the carrion flower or the corpse flower because the flower’s fragrance is similar to the odor of rotting meat. The Titan Arum was discovered by Italian botanist Odoardo Beccari in Sumatra in 1878. It grows wild only in the tropical forests of Sumatra. The Titan Arum first flowered in cultivation at the Royal Botanic Gardens, at Kew in London in 1889. Since then, over 100 cultivated flowers have bloomed. Titan Arum flowering was first documented in the United States at the New York Botanical Gardens in 1937. After a number of years of vegetative growth, the tuber will send up a single inflorescence with both male and female flowers. 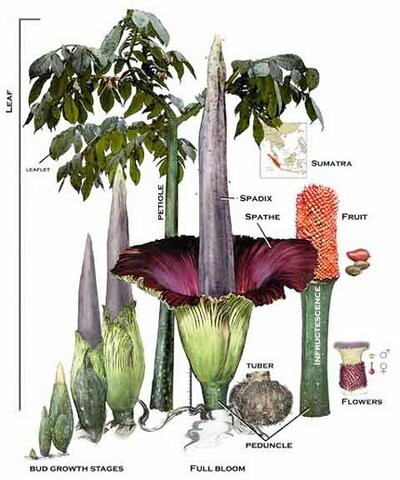 The inflorescence develops over about three to four weeks and when fully developed can reach ten feet tall by three to four feet wide. The spadix (fleshy central column) has thousands of flowers hidden in its base. The outer spathe, which looks like a frilly upturned skirt has a maroon interior and green exterior. The large inflorescence usually opens abruptly (within hours) and remains open for only for a day or a day and a half. 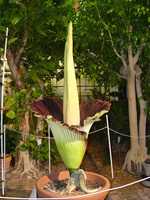 The seed for the Titan Arum at Eastern Illinois University was obtained from the University of Wisconsin – Madison in 2001. The ovule donor was “Big Bucky” and the pollen donor was “Mr. Magnificent” from the Marie Selby Botanical Gardens in Sarasota, Florida. 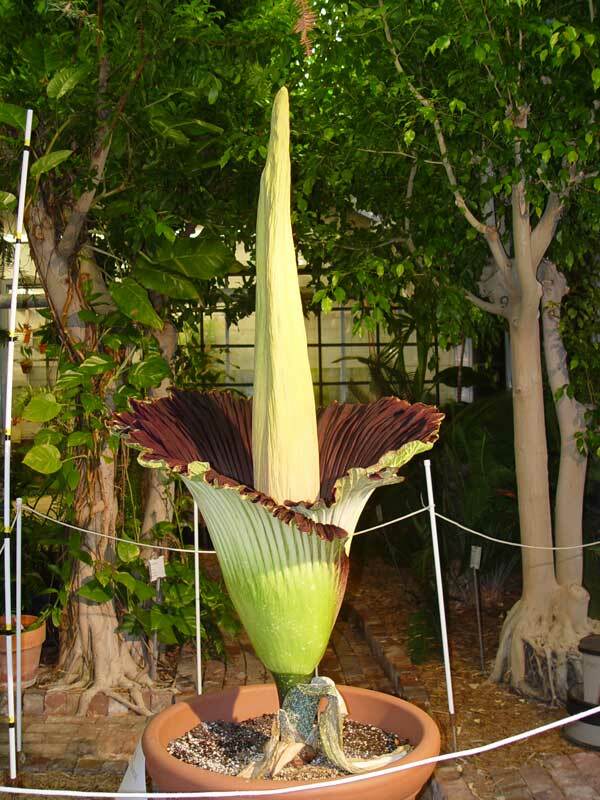 Following six and a half years of vegetative growth, the Titan Arum in the H.F. Thut Greenhouse at Eastern Illinois University produced its first inflorescence in 2008. It bloomed again in 2010, 2012, 2014 and 2016. It's blooming again in 2018!